Create multiple looks with this versatile version of the iconic PANDORA charm bracelet in PANDORA Rose. The radiant hue created by a unique blend of metals and its sleek design ensure that this piece can be worn at work or for a night out. Swap the ends of the bracelet with others in the collection to create two-tone looks and personalise your style with charms. Adjust it to fit with the stone embellished sliding clasp. 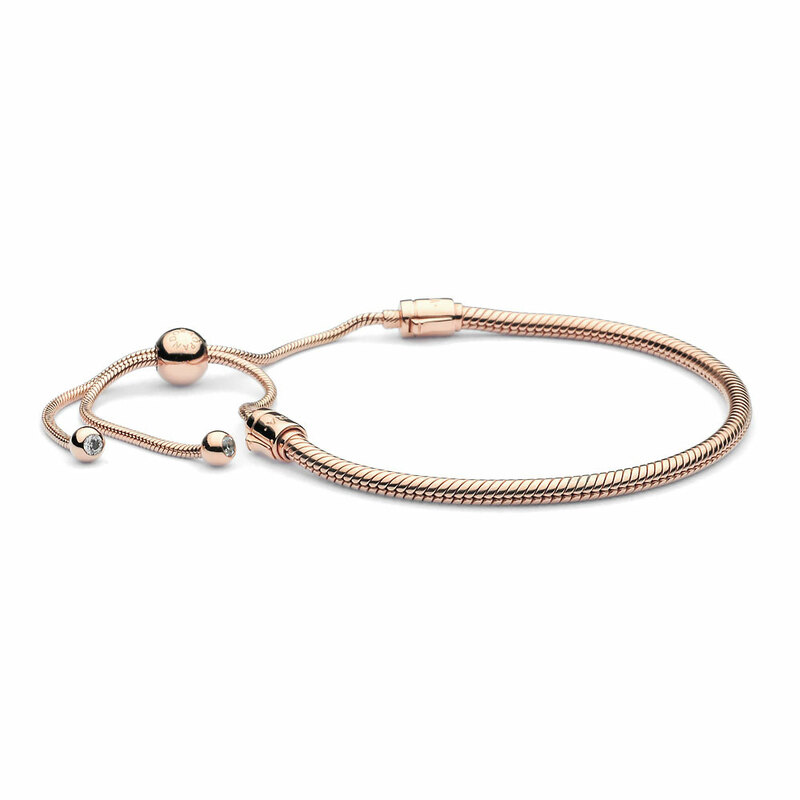 Please note that the sliding clasp is made from 14ct rose gold-plated sterling silver. Available in one size, online and in-store. PANDORA Rose MOMENTS Sliding Bracelet is rated 3.1 out of 5 by 17. Rated 1 out of 5 by Kazcogs from Weak point I received this bracelet for mother’s day only to have it break 3 weeks later I took it back to Pandora and they exchanged it for me no problems but 3 weeks on and I don’t have the Bracelet, it has fallen off again and this time I have lost it including the 5 charms that are on it. So be careful when wearing this as it has a weak point. Rated 1 out of 5 by Ash8191 from Breaks easily Gift for my mum and has broken twice in the same spot and has now lost it. Beautiful design but not strong enough! Rated 2 out of 5 by smok from Rose Gold I Love Rose Gold and was very excited when the Rose collection came out. This bracelet is beautiful unfortunately, the slides do not stay closed. I would love to wear the bracelet more but constantly having to push the slide back up has me leaving the bracelet at home. I hope Pandora comes up with a solution. Rated 1 out of 5 by Grizzlies 50 from Sliding off and on I got this for Christmas 2018 from my son and I wish I could return. The balls are terrible they dont stay tight. The more i wear it , it comes loose. I have to keep checking to may sure it hasnt fell off. Bad choice for something that cost soo much. Disappointed.